A Gateway Sculpture for the new Tahoe-Reno Industrial Center , home of the new Tesla Gigafactory 1. 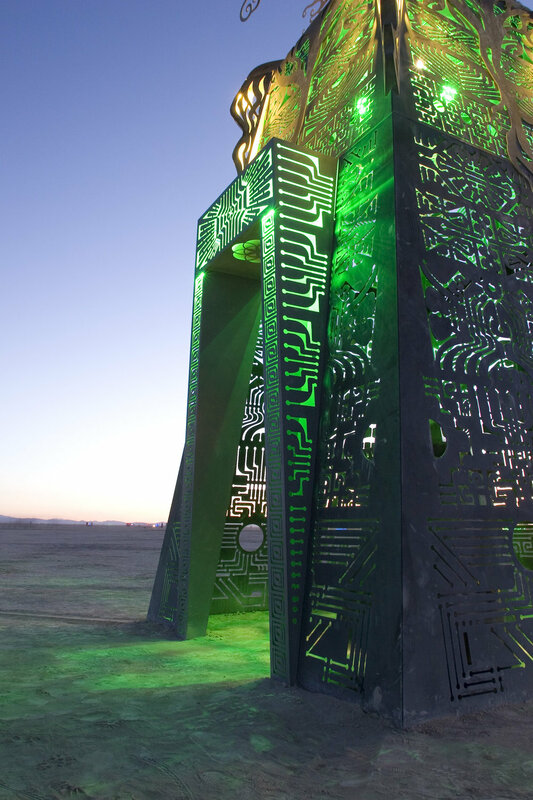 Transition Portal is a monumental gateway sculpture intended to herald the arrival of future technology and its creators. 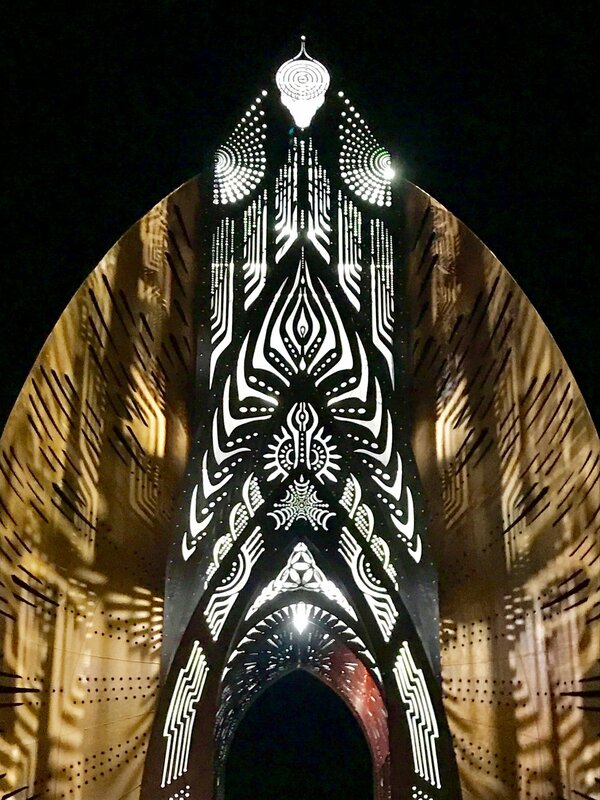 Situated at the entrance of the Tahoe Reno Industrial Center, its 30-foot tall, 15-foot wide illuminated presence welcomes us to a place of visionary new beginnings. 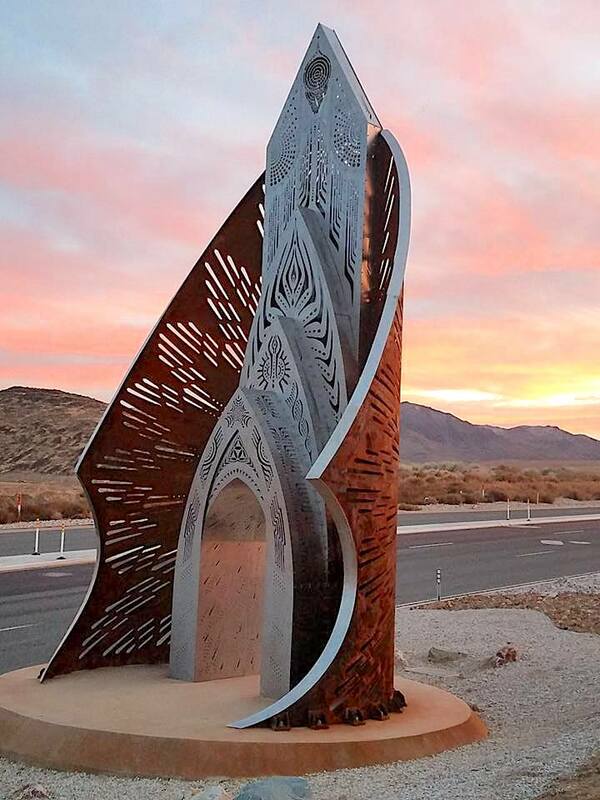 Transition Portal’s symbolic tubular shape of curved weathered steel honors the earth and the traditional mining industries of Nevada’s past, while it embraces a laser-cut stainless steel doorway that symbolically leads us onward and upward to a new world of energy creation and emerging technology. It is a hopeful and futuristic gateway, literally and symbolically filled with light. Transition Portal is intended to illustrate the transformation of human evolution towards a sustainable future. Upcoming exhibition of "No Spectators- the Art of Burning Man" at the Renwick Gallery/Smithsonian Institution opening in Washington DC in March 2018. The Future's Past sculpture will be installed outside on Pennsylvania Ave and I street from March 2018 to January 2019. Private sculpture commission for a vineyard in Calistoga, CA, USA. estimated completion 2018. Upcoming 25' tall sculpture for the Panorama music and tech festival on Randall's Island NYC.